2012 Toyota Prius c Pros and Cons: Why (Not) This Car? Once a niche product, the Prius has become the third best-selling car in the U.S. But Toyota hasn't had nearly as much luck selling hybrids based on its regular cars. The solution: make Prius into a brand covering multiple models. With the smaller, cheaper Prius c, what do you gain, and what do you give up? The lowest trim level. Interesting textures. Too many interesting textures? Why the 2012 Toyota Prius c? The #1 benefit of the Prius c is obvious. It has the highest EPA ratings of any car, 53 miles-per-gallon in the city and 46 MPG highway. This noted, the EPA ratings for the larger, smoother, and more powerful regular Prius are almost as high in the city (51) and are actually a little better on the highway (48). The Prius c only goes significantly farther on a gallon of gas if you're willing and able to drive it with a very light right foot, especially when braking. Then you'll regularly observe over 60 in suburban driving. I observed as high as 82 for the trip from my house to my kids' school. The regular Prius and the Yaris are among the most reliable cars in TrueDelta's Car Reliability Survey. 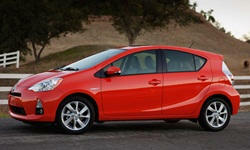 Since the Prius c is based on the latter and has a powertrain like the former, its reliability should also be stellar. Clear tail lights allegedly provide a family connection with other Prii. The Prius c is also the cheapest hybrid you can buy, with a starting price under $20,000. The regular Prius is about $4,000 more before adjusting for feature differences, and about $3,000 more afterwards. A Yaris LE automatic is $2,850 less before adjusting for feature differences, and about $2,000 less afterwards. If you drive a little more than the average person, 15,000 miles a year, and much of this involves traffic signals, you'll save about $500 a year in gas with the Prius c compared to the Yaris, for a four-year payback even before factoring in the higher residual value of the hybrid. Not bad. The starship driving position of the regular Prius isn't for everyone. In the Prius c you sit higher beside a less intrusive center console and behind a more upright windshield. As a result, many people will feel more relaxed and confident while driving the Prius c.
Compared to the regular Prius, the smaller car also has better instruments and a conventional shifter rather than a joystick with an unusual shift pattern. Exemplary driving style feedback makes it intuitive and even enjoyable--like a video game--to drive the car in a way that maximizes fuel economy. Why Not the 2012 Toyota Prius c? The gasoline engine, electric motor, and battery pack in the Prius c are both considerably smaller than those in the regular Prius. Combined power output is 99 horsepower, compared to 134 in the larger car. If you feel the need to mash the go pedal, you'll experience considerably more oomph in the original car, especially if you select the "Sport" driving mode (which isn't offered in the Prius c). Even using a moderate foot to keep up with the general flow of traffic the Prius c's engine sounds louder and more strained. But I could personally live with this shortcoming, as I enjoy taking it easy while driving hybrids. A larger shortcoming for me: you also have to use a lighter foot when decelerating in the Prius c to avoid engaging the conventional brakes and so wasting energy. It can't regenerate energy as quickly as the regular Prius, either. The Prius c handles better than the regular Prius. It should, since it weighs about 600 pounds less. But a 2,500-pound car should feel even more agile than the Prius c does. The suspension simply isn't tuned for sporty driving, and as in the regular Prius the steering is quite numb. The related Yaris handles better, especially in sporty SE trim. Not roomy, but a couple of adults will fit better than you might expect. You'll discover cheaper-looking materials inside the Prius c than inside the regular Prius, but they're at least as good as those in the average small hatchback. The use of a wide range of unusual textures on the omnipresent hard plastics adds visual interest (less charitably, one might describe the interior design as busy). To me, none quite seemed cheap. 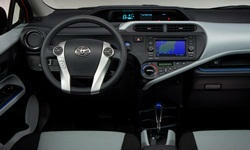 Between the hard-working powertrain and minimal sound insulation, the Prius c is noisier inside than the regular Prius. But I found it no worse than the average small hatchback, and certainly livable. Others have exaggerated the amount of noise inside the car. Economy-minded drivers who spend much time on the highway will be better off in a larger hybrid or perhaps one of VW's diesels. But the more efficient, less expensive, easy-to-operate Prius c is very well-suited to city and suburban driving. Low on performance, but strong on economy...if driven with a very light foot. Not a lot here, either, but enough for the typical weekly run to the grocery store. One-week loan. Toyota provided the car with insurance and a tank of gas. 2012 Toyota Prius c pros and cons, according to Michael Karesh: the best reasons for buying (or not buying) the 2012 Toyota Prius c. Join TrueDelta to post your own impressions.